We stock and supply hundreds of original reclaimed doors. Ideal for either internal or external use. Available in a wide range of styles and sizes. They may need further work to fully restore them ready for fitting. We can carry this out for you, or you can take them on as a personal project. If you’d like to add or replace any glass we can create fully bespoke etched or stained glass panels to suit our reclaimed doors. Take a look at our beautiful range for inspiration and request a quote. 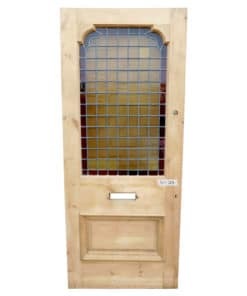 We also supply custom door frames made from high quality hardwood. Get the full package deal for a truly stunning entrance.